Those who are indigenous to this land we call “The United States of America” have been long misrepresented and pushed out of American history textbooks in favor of glorifying those who now rule this nation and represent the dominant culture. What kind of democracy are we when education institutions and teachers refuse to mention the fact that 10 to 30 million Natives were killed at the hands of European invasion and colonialism? What is the point of having a “free market of ideas” when selective and biased history is being taught to our children? There is no other way to put it, but erasing the memory of an entire race of people through distorted history is a systematic way of deceiving and lying to our children. Not only are we presented with biased history, but we are also subjected to an ever-growing culture of capitalism, in which commercialization of an ambiguous holiday merely pulls us away from facts and meaning. Turkeys are associated with “Thanksgiving” in the same way Santa Clause and the Easter bunny have become synonymous with Christmas and Easter, respectively. Through the guise of innocence, capitalism is constantly telling us to consume because consumption equals “happiness.” Tomorrow is not “Black Friday” for nothing. After some exploring, the Pilgrims chose the land around Plymouth Harbor for their settlement. Unfortunately, they had arrived in December and were not prepared for the New England winter. However, they were aided by friendly Indians, who gave them food and showed them how to grow corn. When warm weather came, the colonists planted, fished, hunted, and prepared themselves for the next winter. After harvesting their first crop, they and their Indian friends celebrated the first Thanksgiving. The ugly truth is that many Pilgrims were thankful and grateful that the Native population was decreasing. Even worse, there was the Pequot Massacre in 1637, which started after the colonists found a murdered white man in his boat. Ninety armed settlers burned a Native village, along with their crops, and then demanded the Natives to turn in the murderers. When the Natives refused, a massacre followed. Captain John Mason and his colonist army surrounded a fortified Pequot village and reportedly shouted: “We must burn them! Such a dreadful terror let the Almighty fall upon their spirits that they would flee from us and run into the very flames. Thus did the Lord Judge the heathen, filling the place with dead bodies.” The surviving Pequot were hunted and slain. Those that escaped the fire were slain with the sword; some hewed to pieces, others run through with their rapiers, so that they were quickly dispatched and very few escaped. It was conceived they thus destroyed about 400 at this time. It was a fearful sight to see them thus frying in the fire…horrible was the stink and scent thereof, but the victory seemed a sweet sacrifice, and they gave the prayers thereof to God, who had wrought so wonderfully for them. Squanto had learned their language, the author explained, from English fishermen who ventured into the New England waters each summer. Squanto taught the Pilgrims how to plant corn, squash, and pumpkins. Would the small band of settlers have survived without Squanto’s help? We cannot say. 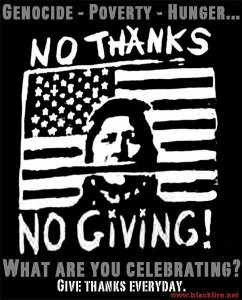 But by the fall of 1621, colonists and Indians could sit down to several days of feast and thanksgiving to God (later celebrated as the first Thanksgiving). Note that this text states the first Thanksgiving was on 1621. Indeed, there was a feast on that year, but it was not called a “Thanksgiving feast” nor was it repeated until years later after the Pequot Massacre in 1637. In regards to Squanto, the correct question to ask is: How did Squanto learn English? History textbooks neglect to mention that the Europeans did not perceive Squanto as an equal, but rather as “an instrument of their God” to help the “chosen people.” It is also omitted that, as a boy, Squanto was stolen by a British captain in 1605 and taken to England. He worked for a Plymouth Merchant who eventually helped him arrange passage back to Massachusetts, but less than a year later, he was seized by a British slave raider. Along with two dozen fellow Natives, Squanto was sold into slavery in Spain. He would manage to escape slavery, journey back to England, and then talk a ship captain into taking him along on his next trip to Cape Cod in 1619. As Squanto walked back into his home village, he was horrified to find that he was the only surviving member of his village. The rest were either killed in battle or died of illness and disease. Excluding Squanto’s enslavement is to paint an incredibly distorted version of history that suggests Natives like Squanto learned English for no other reason but to help the colonists. It is to glorify the Europeans and erase the struggles and experiences of the Native people. When history is transformed into myths, tales, and bedtime stories, we ignore historical research that enables us to learn valuable and meaningful lessons about our present, as well as about our future. History is meant to be an accurate and honest account of civilizations, cultures, and events; not a body of ethnocentric and selective alterations. Thanksgiving is full of embarrassing facts. The Pilgrims did not introduce the Native Americans to the tradition; Eastern Indians had observed autumnal harvest celebrations for centuries. Our modern celebrations date back only to 1863; not until the 1890s did the Pilgrims get included in the tradition; no one even called them ‘Pilgrims’ until the 1870s. I did not write this article with intentions to offend or say we shouldn’t celebrate “Thanksgiving.” None of us are responsible for the atrocious deaths of Natives and Europeans. None of us caused the plague or the massacres. But as human beings, I do feel that it’s important for us to approach history with honesty and sensitivity. Perhaps some of you don’t believe this history is relevant to you, but I would strongly argue that a history that is not inclusive is a dangerously racist and prejudice one. Yes, we should spend time with our families and Loved ones, and yes, we should be grateful and thankful for all that we have, but not at the expense of ignoring an entire race of people, their culture, and their history. The fact that history textbooks and schools try to glorify the Pilgrims while omitting significant facts about the Natives represents that there is a lot to improve in the United States. Let us not become blinded by super-patriotism or blowout sales of “Black Friday.” Let us give some thought to the Native people, learn from their struggles, and embolden ourselves to stand up against racism and genocide in all forms. UPDATE: Thank you all for commenting and sharing your thoughts on this post. Unfortunately, I do NOT write on this blog anymore, but you can still share your comments on an updated and revised piece I wrote on my new blog (see link below). Also, there are others who have written excellent articles on the truth of “Thanksgiving” and their work certainly deserves more attention than this post.